We first met each other while living in Hayward and attending college together at the California State University there. On weekends we would occasionally spend time in Oakland, touring the shops at Jack London Square and enjoying the view of the San Francisco Bay from the wharf. In those days (1987) we weren't all that interested in trains, nor did Oakland offer many places downtown that were comfortable to hang out and watch them. That changed dramatically with the construction of the Jack London Square Amtrak station (OKJ) and its splendid pedestrian walkway. Now there is a perfect venue for railfans to relax and enjoy the passing parade of Amtrak passenger trains, Union Pacific intermodal freights and occasional trackage rights trains from the Burlington Northern Santa Fe. 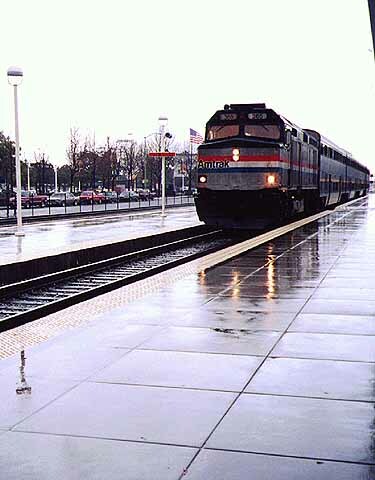 A permit is required to park in the Amtrak parking lot, which is seldom full on a weekday. You can stroll north from the station along the Embarcadero and likely see trains as they run along double tracks planted right in the middle of the street. 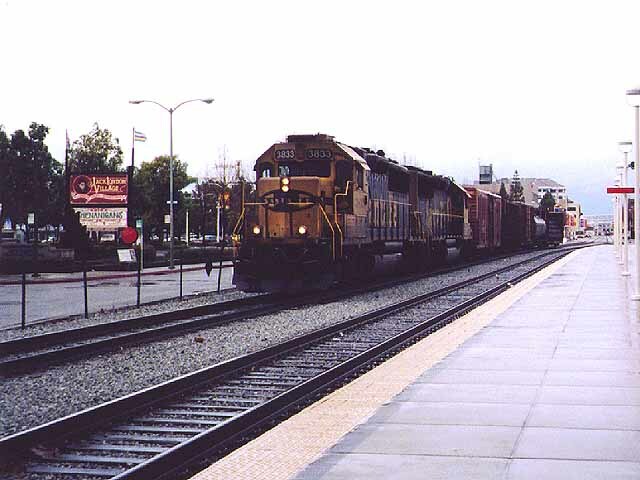 The nearby Port of Oakland is a busy place, with Union Pacific headquartered nearby and dozens of frieghts leaving or arriving at the yard daily. Drive around the area and you will also see the service areas for Amtrak locomotives and passenger coaches, and a storage area for Union Pacific and former Southern Pacific business cars. 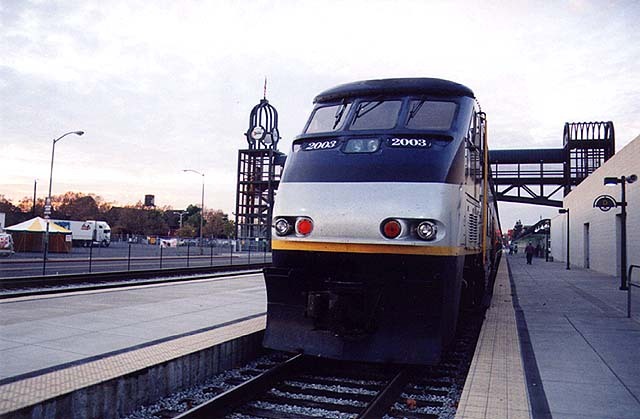 Amtrak California unit 2003 gets a well-deserved rest at the end of its southbound Capitols run in early November 1998. The pedestrian bridge leading between Jack London Village and the Jack London Square station (at right) is visible in the distance. Photo by Roni Gehlke. Same day as #1, but several minutes later as a typical California sunset descends over the Bay. AMTK 2009 prepares to depart with San Joaquin Train 716. We left the station just after this shot was taken and slogged through commute traffic back to Oakley, stopping at an office supply store and grocery store on the way. ... And we still managed to beat the train home! Photo by Roni Gehlke. In the winter of 1998 California was in the grips of El Nino. For railfans, that meant braving daily downpours for the chance to catch a little trackside action. On a typically ugly day in late February, we piled into the car and battled the raindrops all the way to Oakland. The rain let up only briefly. Most of the visit we huddled under umbrellas and awnings, freezing from the gusty winds as we took shelter in the walkway above the tracks. You can easily see how nasty a day it is as F40PH Amtrak 365 rolls into Jack London Square with the westbound San Joaquin in tow. 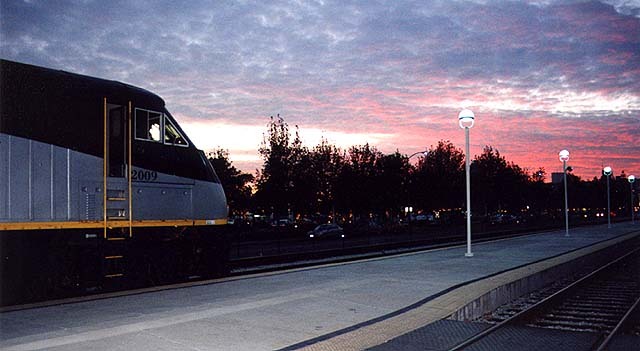 Oakland is the final destination for this train, which originated in Bakersfield. During the train's brief layover in Oakland prior to its return south, we were able to climb up to the overhead pedestrian walkway and look down on the consist and listen to the engines idle. Quite a sight. This venerable F40 and others like it have largely been replaced by the sleek F59PHI (pictured above), which promises to be the locomotive of the early 21st century. Photo by Roni Gehlke. You can see the underside of the pedestrian walkway in this shot of Chicago & North Western unit 8648, which literally snuck up on us while we were visiting the shops at Jack London Village, which lies on the opposite side of the tracks. The rain was coming down pretty good as the three of us stood on the street corner under one umbrella, trying to shoot prints and video while corraling Benji so he wouldn't dance off into approaching car traffic. A moment after this photo, the southbound C&NW hauling a load of autoracks met a northbound UP stack train destined for the Port of Oakland on the adjacent track. Photo by Roni Gehlke. 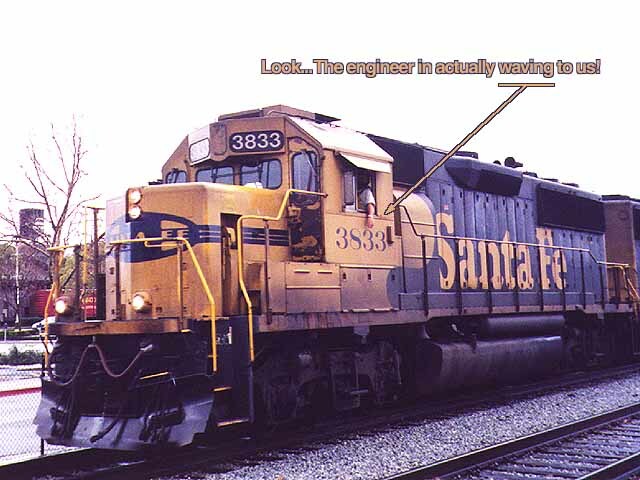 ATSF 3833 rolls along the Embarcadero with its short consist of boxcars and such. Glenn remained on the overhead walkway with the video camera while Roni and Benji raced down to the station platform with the point-and-shoot. These tracks are owned by Union Pacific, but BNSF units such as this one operate over the route via trackage rights. Photo by Roni Gehlke. Benji and Roni were rewarded with a friendly wave from the engineer. So seldom do we get shots like this that we couldn't resist having a little fun with it. Rail photography purists will no doubt be disappointed that we "destroyed" this image by writing on it. If anyone really wants the unadulterated version, Glenn will be happy to post it for you upon request. Photo by Roni Gehlke. 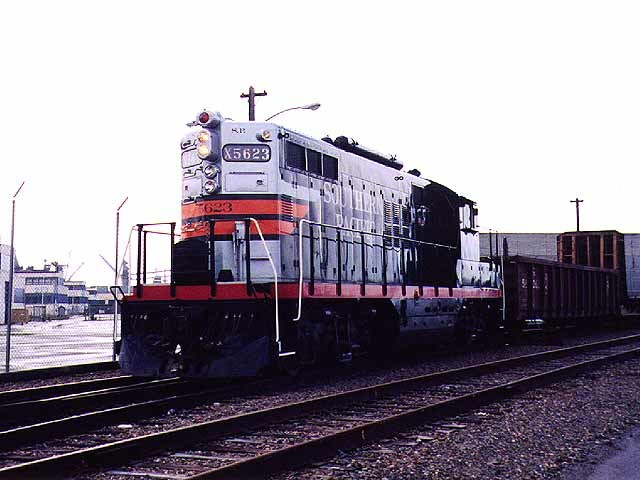 Former Southern Pacific GP9 5623 now spends its days working the Port of Oakland on the Oakland Terminal Railway. It wears the distinctive "black widow" style paint that Espee made famous a half century ago. 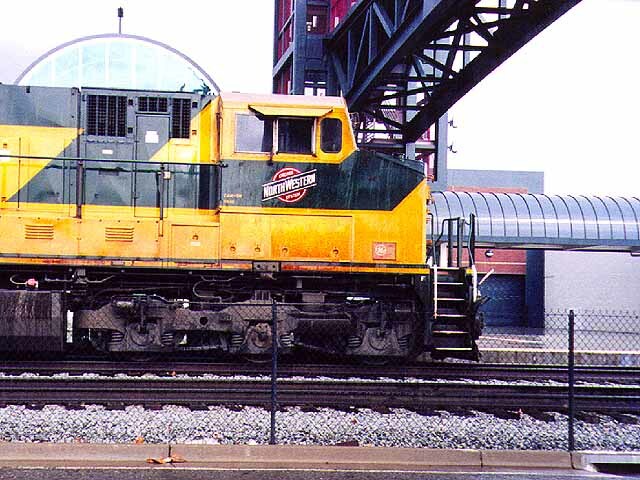 We drove out to the port in hopes of seeing this locomotive, but were quite surprised when we accidentally found it. There were too many trucks lined up along the curb to park, so Roni jumped out of the car to take the shot while Glenn circled around the block and came back to pick her up. The clouds created a lot of glare that unfortunately muddied up this photo, which was our best. We'll try and catch it again some other time. The crew obviously are used to being photographed because they stopped the train momentarily to provide Roni with a better shot. Photo by Roni Gehlke. This page was last updated Wednesday, August 4, 1999 at 00:10 hrs.